Bartender Gabrielle Daily, with one of Press' beloved Bloody Marys. 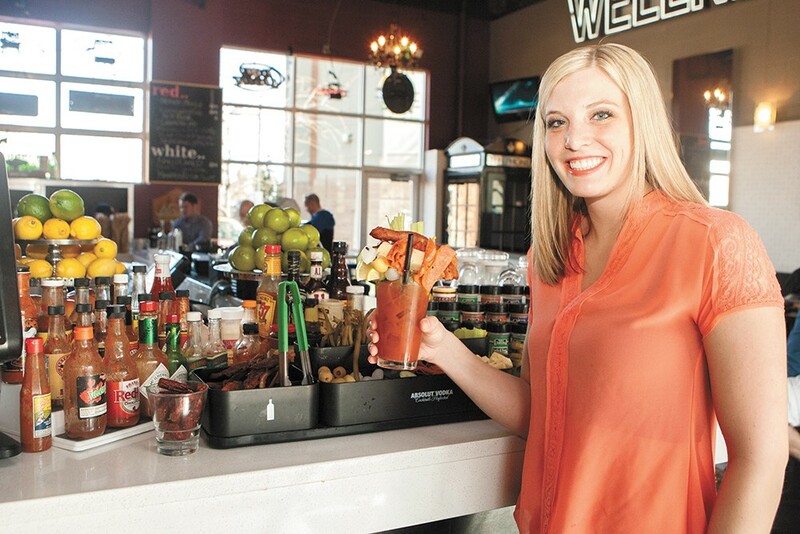 What's the secret to making the best Bloody Mary in Spokane? According to Press bartender Caitlin Sutton, it's a little bit of everything. "Press' Bloody Mary bar has so many spices, sauces, foods and juices to test and try, and that's exactly what people want. Choices," Sutton says. "Press' Bloody Mary bar let's you customize your Bloody Mary the way you like it. Plus, making it yourself is always fun." Over the past four years, the South Hill pub's buffet-style Bloody Mary bar has become a Sunday staple for many of Press' regular customers. Here's how it works: First, you pick your poison: vodka or gin? On the first Sunday of every month, Press offers a $5 special on locally distilled Dry Fly spirits. Then, you choose your mix: How about spicy and smoky "chipotle habanero" — made from scratch with chilies and peppers? Or you could go with the "classic," Press' most popular mix, made of peppercorns, tomatoes, Worcestershire sauce, horseradish, lime juice, garlic salt and celery seed. There's also a basic tomato and a clamato mix. From there, you can garnish your cocktail with as many spices, sauces and trimmings as you can fit in your glass — and at no extra charge. "They can go old school, Chuck E Cheese, graveyard style," says Press general manager Eli Gardner. The bar features 40 different hot sauces; 55 different salts, herbs and spices; four flavors of pickled asparagus; pickled green beans; pepperoni slices; pepperoni sticks; pepper jack cheese; dill pickles; celery; olives and crispy, fresh bacon. And every week, Gardner brings in new trimmings for customers to try. His latest additions include fresh horseradish, kalamata olives and Jack Daniel's mustard. After a boozy Saturday night on the town, says Gardner, "What better for your hangover than a nice, big Bloody Mary with a whole meal of trimmings?"